Cabinets have 2, 3, 4, or 5 drawers, and are made for either letter-size paper or legal-size paper. Letter-size cabinets are typically 15 inches wide and legal size are 18¼ inches wide. 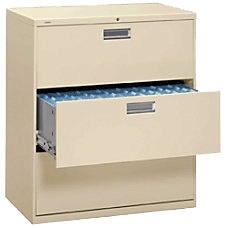 The typical office vertical file cabinet is 28½ inches deep and the drawer holds 27 inches of files. Shallower cabinets are also made: 26½-inch deep cabinets with 25″ drawer depth, 25″ deep cabinets with 23½-inch drawers. Naive buyers shopping for price often inadvertently compare units with shallow and deep drawers. Lateral files are wider than they are deep. Widths may be 30, 36 (33¼ inches of filing space, measured laterally), 38, 42, or 44 inches (the last with 39¼ inches of filing space). Drawers can be configured in different ways, for example, as one row of hanging folders running front-to-back, or as two rows side-by-side. 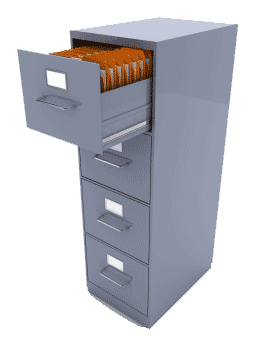 An advantage of this flexibility is that a drawer can be configured to hold data printouts or other odd sizes. 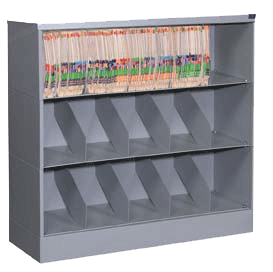 These files are simply shelves with fairly closely-spaced vertical supports, used with end tab folders. Besides being less expensive than cabinets with drawers, the tabs of all files are constantly visible. Most users of open-shelf systems use colored codes on the tabs. They are popular in, for example, medical offices. Whenever a file is used the tab for year is checked. If it isn't the current year it is updated by covering it with a colored adhesive label for the current year. Since each year has a distinctive color, it is easy to spot old files and move less active files to storage areas.